While I have a not very convincing no sailing pedigree, Stoffel has been sailing since he was a wee lad. He’s crossed multiple oceans and competed in multiple offshore races. 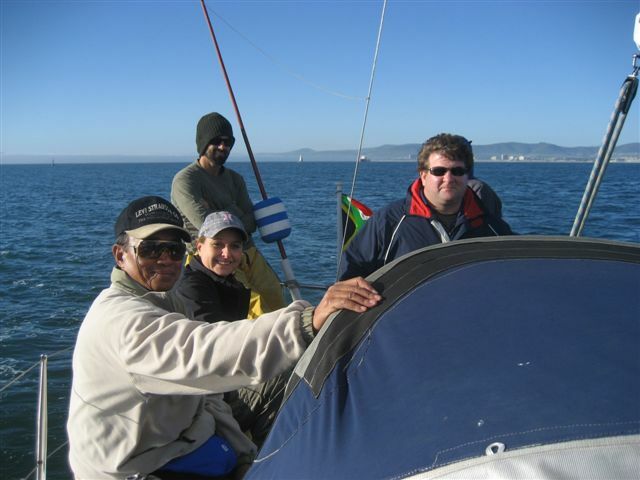 His father owns a small racing yacht which he sails on often and he has more than earned his stripes as a sailor in the notorious Cape waters. When we met and things looked like we might actually spend whole weekends and holidays together, I became very excited because I knew that “this would be my opportunity to finally learn to sail.” (I also probably thought it would be romantic.) So I very excitedly headed off for my first twilight sail on Ballyhoo with Stof and the rest of the bally crew. At the time, I had not considered that there might be a difference between racing and cruising boats and I was somewhat disappointed to note the lack of cockpit table and seats to rest our drinks and backs (respectively). I was somewhat appalled surprised when we made our first tack and I was instructed to swing my legs over the side of the boat, stick my head under the wire and lean out with nothing but one wire holding about 6 of us from flying off into the drink while the boat heeled over precariously. My vision of sailing was radically altered. Earlier this year, I completed a competent crew course and I am busy doing my ‘day skippers’ course. There is so much to learn and it is really, really challenging. The classroom theory is great: I have never been one to shy away from a classroom and the navigation is loads of fun in an oh!-I-haven’t-done-this-kind-of-thing-since-school* kind of way. Being on the boat and getting it to work properly, especially without Stof around to run all of my decisions by, is particularly tough. I am not confident with new physical challenges and sailing presents a mass of new physical challenges all the time. Being capable of controlling a boat requires flexibility and balance and more strength than I feel like I have in my puny arms. So I have to simultaneously learn how to actually sail and learn how to quieten the beasties inside who whisper that I may not be very good at it. The good thing is that practise, she makes it perfect. And I’m going to get a whole lot of practise. One thing is for sure, I’ll be able to answer any question regarding my sailing abilities with a resounding “yes!” by this time next year. *Navigation involves a lot of mathematical skills. I am a lawyer – we’re not known to be highly numerate. Sara, you’ll grow as you go. And Eric and I will join you anywhere in the world for a week or two of sailing. I think that he has some experience and I was on the the crea team in high school (which gives me exactly zero sailing experience). Thank you both, Lovelies. Today has been a really exciting day! Jo: I’m super keen to get my hands on all manner of books for the crossing. Any transferred arm strenght will be greatly appreciated. I ALMOST was on a racing crew of a family friend’s boat and I so regret not doing it, though I am sure I was picturing more relaxing and cocktails than nearly falling off the boat. Seriously, I will dream of a week of sailing! hihi! i stopped by from sid’s blog a while ago (and have since subscribed *cough*stalked*cough* in google reader), and love hearing about your trips – thanks to you, i’ve now added mexico AND antartica to my list of places to visit 🙂 i’d really like to take up sailing again though (haven’t been since my days with uct’s yacht club! ), and hope you can give me some information on the sailing courses you’ve been doing (as in who, where, how much it costs, etc)? i really have no idea where to start looking so your help would be much appreciated! thank u so much! 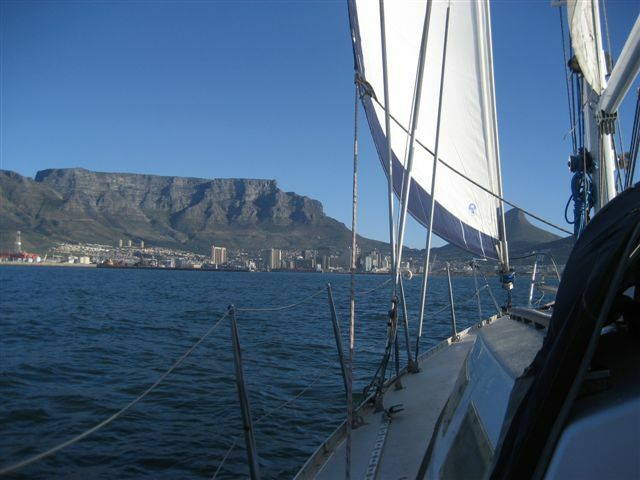 I have done both of my courses through Good Hope Sailing Academy. They were the cheapest school when I was looking around to do the course. Their instructors are (mostly) excellent and it’s been fun doing the courses. (Although I did both of them with at least one matey.) Chat to them about what your level of sailing is and either start with the competent crew course or go straight to day skippers. Then, the other best way to get into it is to try get onto a boat for wednesday evening racing: that way you go out sailing often and get to have fun doing it. And come and say hi if you see me hanging around the yacht club!